With Americans popping psychiatric drugs like so many pieces of candy, you'd think mental illness would have decreased since the first antipsychotic medication was approved in 1954. Not so. In 1987, the year Prozac was approved, 1 in 184 Americans was receiving disability payments for a mental illness. Two decades later, the rate had more than doubled, to 1 in 76. Why? Anatomy of an Epidemic offers some answers, charting controversial ground with mystery-novel pacing. 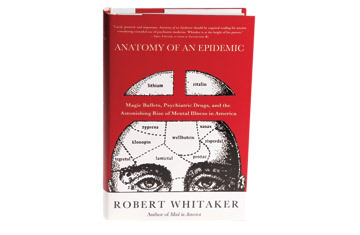 Despite much vaunted claims to the contrary, writes Whitaker, a medical journalist, "there was never any evidence" in the scientific literature showing that certain mental illnesses result from faulty brain chemistry. ("The serotonin theory of depression," says one quoted psychiatrist, "is comparable to the masturbatory theory of insanity.") Additionally, says Whitaker, certain medications intended to correct chemical imbalances may actually create them. Psychiatric drugs have changed the lives of millions, but this book explores how they would have fared without them. It's an alternative worth imagining.